This wood stork flew conveniently right over to my side of the pond! Thank you Mr. Stork!One bird I have been trying to photograph ever since moving back to Florida one year ago is the wood stork. I have seen them many times, but have never been in a good position or circumstances to photograph one. That was until I joined the NPPF meetup group on a Sunday morning photowalk to Kapok Park. New photo friend Marc was also there, and he happens to be a Nikon shooter as well. He had let me borrow his Nikon 2x teleconverter, but it did not work with my somewhat older Nikkor AF ED 80-200mm f/2.8D lens. So he very generously offered to let me use his Nikkor AF-S 70-200mm f2.8G lens which works perfectly with the 2x teleconverter! On my Nikon D300, this gave me an effective focal length of 600mm! However, I can tell you I quickly found 600mm to not even be enough. So if you do drop $10,000 on Nikon's 600mm lens, you still may not be satisfied. Marc's generosity did not end there though. 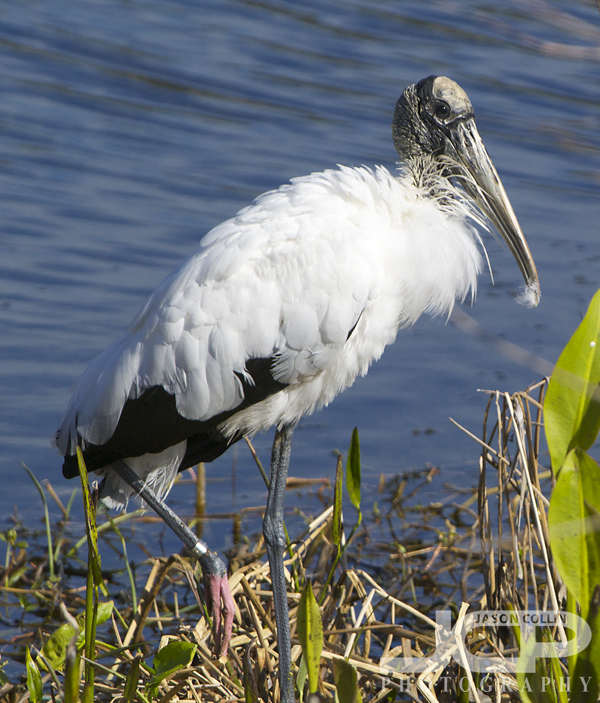 The wood stork was on the far side of the pond from me when I first spotted it. It would have taken me a good 10 minutes to walk all the way around the pond over to the sandy bank it was on. I saw Marc just a few dozen meters from the wood stork and waving at me. He had spotted it first and was going to have the best chance to shoot it . . . until he startled it over to RIGHT in front of me on the far bank! What a pal. I never had a totally clear shot, as reeds and tall grass were in the way from my position on the boardwalk, but nonetheless I was finally glad to be able to make a shot of a wood stork. Thanks Marc!